" Vending machines open all night "
Vending machines illuminate the passersby with their electric signboard even on a dark road at night. They satisfy the our thirst all night, and keep the neighborhood safe. They give an even more lively look to bustling neighborhoods with their colorful illuminations. They are found everywhere in Japan, and supply free emergency drinks in a time of disaster. They are now an indispensable part of the Japanese culture. The oldest vending machine was an apparatus to sell holy water installed in an Ancient Egyptian temple. Vending machines have been a part of our history and have been serving us greatly. I regard them to be one of our greatest inventions. 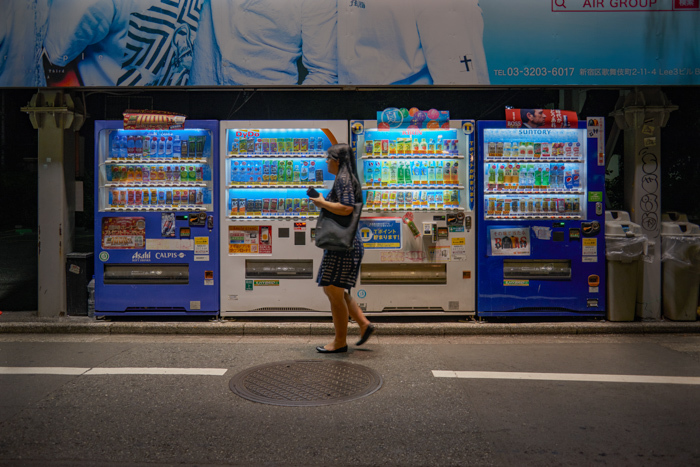 There are 9 million vending machines in the entire world, and 2.5 million of them are located in Japan. While they are already saturated in the small nation of Japan, I expect that more will be installed all over the world. I hope they more vending machines will serve convenience, and support people's lives and be a beloved part of them. Latest vending machines have security cameras installed and watch over the streets, and communicate hazard information to us during a disaster. They are in fact highly-functional robot machines. Vending machines are installed in such a way that they do not get in the way of pedestrians and that they would not litter their surroundings with empty cans and bottles. They are an invisible part of the cityscape, and we are often unaware of their existence. However, when I am out and about, I find myself looking for a vending machine desperately, either to prevent heat stroke on a hot summer day or to get some warm tea on a cold winter day. I feel that vending machines have a sense of uninterrupted and welcoming warmth. 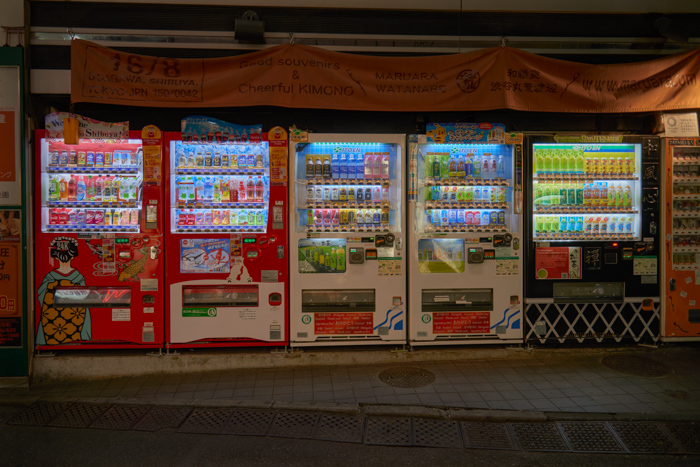 Japan has so many vending machines thanks to its overpopulation, safety, hot summer days, and advancements in engineering technologies. I think that they really reflect the Japanese way of life. I love, use, and attempt to communicate with my dear vending machines every day. I believe they will keep illuminating and supporting our lives for many years to come. Please Contact us for inquiries and to view the prints.